A coronal mass ejection as seen by the SMM Coronagraph on August 18, 1980. 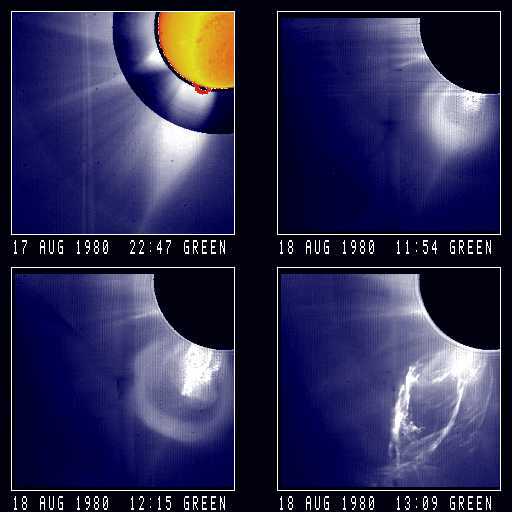 The upper left panel is a composite image of the corona taken prior to the ejection. The solar disk and limb (in yellow and red) were photographed by the Mauna Loa Prominence Monitor in the neutral emission line of Hydrogen Alpha and show a large prominence extending over the southeast limb of the sun. The lower corona, showing a large helmet streamer over the prominence, was recorded by the Mark III K-Coronameter at Mauna Loa and the outer corona was photographed by the SMM Coronagraph. Pre-event images such as this recorded the swelling and expansion of the coronal helmet streamer prior to the mass ejection. The mass ejection is shown in the next three panels. Solar north is toward the upper left. Cavity and highly structured (prominence) core rise in streamer. Streamer deforms into frontal loop around cavity. Loop front flattens and sharpens as it moves outward. Core is extremely bright in H-alpha filter from 11:50 until 15:26. Streamer is blown out. Big deflections.